The Material Parameter Measurement Module (MPM) measures the Young’s E modulus and the loss factor η of the raw material used for loudspeaker design. The vibration beam technique (ASTM E 756-93) is modified to be capable of measuring also soft materials, such as thin foils of plastic, rubber and any kind of paper and impregnated fabric. After cutting 1cm strips, the probes are clamped on one side and excited pneumatically by using the Suspension Part Measurement bench (SPM bench). 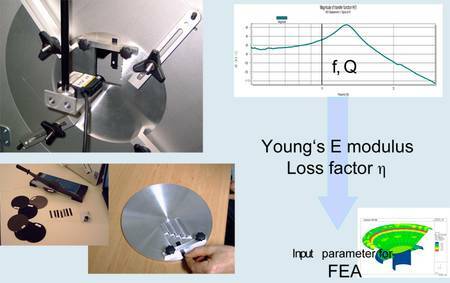 The figure above shows the user interface of the MPM software for measuring the Young’s E modulus and loss factor of material samples. The software automatically adjusts the voltage of the stimulus to generate the desired target value of the maximal displacement (in this example 1 mm). The density of the material, the thickness of the sample and the length of the beam are additional input parameters provided by the user.